Key Performance Indicators (KPIs) are metrics that will measure outcomes against strategies set at the level of the whole venture, a function of it, and even an individual department. You can also use key performance indicators to compare your venture’s finances and performance against other businesses within your sector—if you are fortunate enough to have a source for them. Of course, if your strategy is not well defined in the first place it will be difficult to set any specific measurement criterion—beware! Strategies are naturally written in very large terms. They depend on three things, as Richard Rumelt says1, clear diagnosis, guiding policy and coherent action. Easy to say and hard to do. The coherent action that Rumelt (the UCLA Anderson professor) talks about, requires that it is measured, but before we can do that, we need to know what the critical success factors (CSFs) are, then, and only then can we determine what the Key Performance Indicators should be. Bear in mind that your key performance indicators can be both financial and non-financial. It may be that in the case of a new venture, the latter may be difficult to quantify. If they are concerned with the values you espouse, for example, it will be important to have the values described in terms that can be measured and tracked. Key performance indicators of the non-financial variety need to be quantified or evidence based to give you good data. They can’t be just your own personal evaluations, unless you have figured out a way to measure them. For both kinds of key performance indicators, you will find considerable help in the eBook, Founders Stay Afloat: by Tracking 25 Key Facts and Figures—a book I wrote specially for first time venture founders. It has lessons that I had to learn the hard way, by trial and error, mainly error! The book contains essential financial stuff on things like cash flow, but also the more tricky things to measure, like the value proposition and the business model. In order to know how the CSFs should be achieved, we need to be clear about the way things are organized to carry out the coherent action. 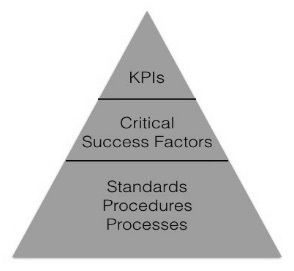 That’s why we can’t move up the levels of the pyramid below, unless we have Standard Operating Procedures (SOPs), that are made up of standards, procedures and processes. Without them all our measurement of outcomes cannot be linked to the actions we have taken. Of course the strategic goals themselves have to be precisely defined, which means that they have to be SMART: Specific, Measurable, Action-oriented and Time-bounded. Key Performance Indicators need to be set for more and more subjects as the startup grows, so the task increases in complexity. Many people use software applications to help them; here is one that offers you a checklist of the kinds of subject to track—PNMSoft. The main categories they suggest, are revenue improvement; cost reduction; process cycle-time improvement; increased customer satisfaction. If you visit their site, you can check subjects for your own sector, locations and size.